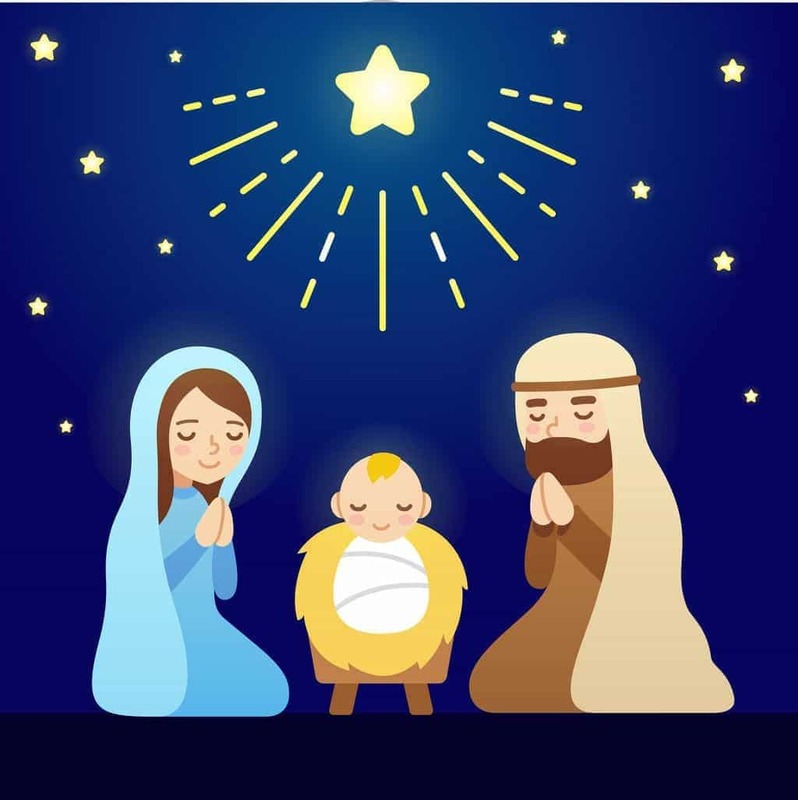 Celebrate the birth of Jesus with these Christian preschool Christmas activities for your classroom or home. Turn your home center into a nativity scene! We put down rolled plastic, covered with hay. Our class is in a church so we had access to a wooden manger from a previous Christmas program. Parents let us borrow large stuffed animals. We already had a baby doll. We set out robes and bath towels (for headdresses) so they could dress the parts. The children loved it! Just be prepared to vacuum each day, and make sure no one is allergic to hay! Place Jesus’ name up on your birthday board/wall. With his birthday. Make sure that you show the children that we celebrate Jesus’ Birthday too. After sharing the Christmas story with children, give each child a glow-in-the-dark star, and tell them that when they see their star glowing, they will always remember why we celebrate Christmas. A great book to read to children about the story of Jesus’s arrival is Who’s Coming to Our House by by Joseph Slate, Ashley Wolff (Illustrator) It is perfect for preschoolers as it uses the animals found in the stable to get the barn ready for Mary, Jesus and Joseph this was my favorite book as a child i’m 19 now!!!!! Hope everyone enjoys this book as much as I do. I work in a Christian preschool and we make mangers out of a half of a toilet tube and cut another tube to make the legs, stapling it on the bottom of manger. We then send it home with the children with a bag of yarn (straw) and a note explaining that the child can put one piece of straw in Jesus’ manger for every good deed. During the last week before we have our Christmas break we send a picture of Mary and Joseph and baby Jesus to put in the manger. This helps the children to focus on Jesus and doing good for others as He taught us. the parents love this idea and the kids really seem to love it also. For each King: First cover the tp roll with either contact paper, regular construction paper, or paint it & let dry. Next, cover one end with the fabric, so one side hangs down longer than the other. Wrap the pipe cleaner around for a band that holds on the king’s headpiece (actually looks more like what a Shepard would wear!). Have child draw on the features on the oval, then glue it on. Lastly, trim the candy wrapper so that you’ve got the shiny ‘present’ left, and not the crinkled edges. We have a birthday party for Jesus in my preschool classroom, and it’s a great way to stay focused on the reason for the season. The children help plan and make decorations, a parent usually donates a birthday cake (or I do :>) ) and we play party games and have activities which focus on the Christmas story. We discuss how we were once babies too, and for a bulletin board we all bring in a baby picture (yes, even me). Jesus in the manger is in the center, and the title is “I WAS A BABY LIKE BABY JESUS”. This leads to some wonderful discussions on how Jesus is God’s Son and was “real” like all of us. We use pictures on the flannel board (I use a Mary Manz Simon book) to put the story in order, match pictures of angels, the star, shepherds, sheep, etc. in a memory game I made using clip art, and of course, we sing the birthday song. It’s a great way to end the week before Christmas vacation.